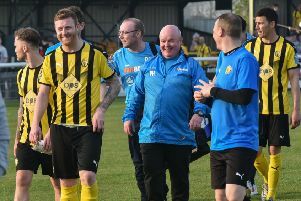 Brakes picked up a point from their first visit to Chorley but will feel they could have taken all three after a performance full of grit and industry against their play-off chasing opponents, writes Paul Edwards. Leamington could not have made a better start as they stormed in front inside the opening 90 seconds courtesy of Danny Newton’s 16th goal of the season. Pressing up the left in their first attack the Brakes skipper drove the ball in low towards goal from inside the box and it ended up in the back of the net via a Chorley defender to give Paul Holleran’s men a dream start. He almost made it two moments later as the ball dropped nicely for him to volley just over the bar. Gradually the hosts recovered from the shock of going behind so early and drew level when Jack Edwards gave away an 11th-minute penalty, James Dean stepping up to send Ross Atkins the wrong way. However, within two minutes Leamington had regained their advantage. James Fry fizzed a low crossfield ball out to Lee Moore on the right, and the in-form midfielder killed it stone dead with his first touch to take his marker out of the game and give himself a clear run on goal from which he made no mistake, confidently slotting past the advancing Sam Ashton. Leamington went close again with Ashton having to scramble back to his far post to push the ball out from under his crossbar following Joe Magunda’s raking cross. At times the movement to the edge of the Chorley penalty area was superb, the visitors clearly thriving on the confidence gained from the weekend victory over Colwyn Bay. This was in evidence again as Hicks received the ball on the edge of the box and found Lee Chilton, whose shot was blocked out to Fry, who fired well over the bar. Hicks had another shot blocked as Leamington piled forward again and the hosts were indebted to keeper Ashton as he plunged down to his near post to push a thumping header from James Mace behind for a corner, from which Delroy Gordon headed wide. Chorley had the ball in the net in first-half injury time but were thwarted by an offside flag. After the break, the Magpies lost Jake Cottrell to a straight red card after the midfielder reacted petulantly to a challenge from Moore, but his loss did not appear to hinder the hosts, who were level within three minutes. It was a goal out of the top drawer from Dean, who got the wrong side of Gordon to latch on to a precise through ball from Burns and lashed a shot across the diving Atkins and into the far corner. A fine piece of play from the Leamington captain saw him drag the ball between two defenders inside the box but he was just unable to provide the finishing touch. Boosted by the youthful exuberance of substitute Bilal Yafai, Brakes poured forward again and the ball eventually found Newton who worked space for a sharp turn and shot that was blocked. Leamington continued to look after the ball well as the clock ticked down, with a Yafai shot deflected wide. With time almost up, hearts were in mouths when Chorley won a free-kick on the edge of the box but the dead ball did not trouble Atkins and Leamington were able to reflect on a well-earned point which moves them further clear of danger. Chorley: Sam Ashton, Mark Ross, Adam Mather, Andy Teague, Matt Flynn, Jake Cottrell, Josh Hine, Dale Witham, James Dean, Aaron Burns (Harry Winter, 59), Chris Simm (Chris Almond, 87). Subs not used: Adam Roscoe, Jack Lynch, Aaron Grundy. Brakes: Ross Atkins, James Mace, Connor Gudger, Joe Magunda, Delroy Gordon, Jack Edwards, Lee Moore, James Fry (Jordan Goddard, 68), Lee Chilton, Nathan Hicks (Bilal Yafai, 81), Danny Newton. Subs not used: Jamie Tank, Martyn Naylor, Lewis Fenney.